Is Nigeria too big to fail? Thanks to the Kouachi brothers, the world seems to care about Nigeria again. By TERENCE McNAMEE. Within days of their deadly terrorist attack in Paris people began to question why the killing of a few French cartoonists could produce such a feverish global response while a massacre of hundreds, possibly thousands of Nigerians by Boko Haram – a group espousing the same brand of Islamic extremism as the Kouachis – was ignored. Whether that was down to double standards or simply geopolitics, the intensifying insurgency in northeast Nigeria is now fully back in the global spotlight. In the wake of the Paris attacks US President Barack Obama and UK Prime Minister David Cameron vowed to defeat the ‘barbaric killers’ of Boko Haram and other terrorist organisations. In one sense, this is music to the ears of both Boko Haram and the Nigerian government. By ‘internationalising’ the insurgency, Boko Haram’s legitimacy within global jihadism is enhanced, accelerating the flow of weapons and fighters from the wider Jihadi network. For its part, Nigeria’s government welcomes any conflation of Boko Haram with Islamic State or Al Qa’ida, since it helps obscure its own culpability in the escalating crisis. No one knows if the pledge by Obama and Cameron to fight terrorism in Africa will amount to much. Many would argue that it would be better for Nigeria – and Africa – if it didn’t. Big powers can unwittingly unleash dire consequences when they try to intervene, even in a limited way, in highly complex conflicts. The current example par excellence is the West’s military intervention in Libya in 2011. President Jacob Zuma, speaking at the World Economic Forum in Davos, has gone so far as to claim ‘the issue of Boko Haram stems from what happened in Libya’. Not quite, but it’s certainly exacerbated the problem. Nigerian troops lack sufficient firepower and support to effectively tackle Boko Haram – hence the deteriorating morale within one of Africa’s most experienced armed forces: dozens of its soldiers are on death row for mutiny – though it’s not the full story. 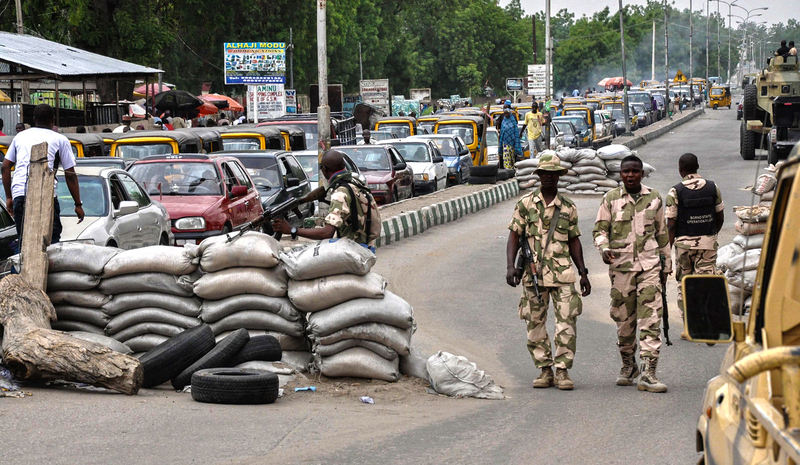 Collusion between Boko Haram and the military has been well-documented. In some cases this is due to corruption, in others it’s ideological kinship. Sometimes, soldiers just don’t want to fight. No one seems to know the true extent of the problem. The official response to Boko Haram’s killing rampage in the northeastern states of Borno, Yobe and Adamawa, now in its seventh – and most destructive, according to a recent report by Amnesty International – year has been inept. Criticism of President Goodluck Jonathan has grown since the last outrage by Boko Haram that captured the world’s attention, the (still unsolved) kidnapping of hundreds of girls in Chibok in April 2014. Leaders in the three affected states have accused him of abandoning the opposition-controlled northeast, in part so voting cannot take place in the volatile region during next month’s national elections. The President’s supporters claim that at least one governor is funding Boko Haram and all three administrations are complicit in the group becoming ‘embedded’ in society due to years of inaction and complacency. Together, they’ve all failed the people of the northeast, one of Nigeria’s poorest regions, home to large numbers of alienated, unemployed youth and state institutions unable to deliver basic services. Its history of religious and communal tensions amplifies the risk of radicalisation. Will any foreign militaries dare to venture into this miasmal mess? The UN Special Representative for West Africa, Mohamed Ibn Chambas, has urged Nigeria and the three neighbouring states directly affected by the insurgency – Niger, Chad and Cameroon – to set aside their differences and create a regional force to defeat the militants. Only Chad appears willing, though tellingly it has sent troops to support Cameroon, victim of several cross-border incursions by Boko Haram, rather than Nigeria. The African Union (AU) has shown itself capable of being an effective coordinator and troop provider in Somalia, delivering a degree of stability to the capital, Mogadishu, that no other multi-national force – including the American-led one in the early 1990s – has achieved. But any joint counter-insurgency plan for Nigeria would need to overcome intense political rivalries and a deep reluctance among key AU states to share intelligence. A direct role for US, UK or other Western militaries appears unlikely, for the moment. Last week the UN Security Council raised the alarm about Boko Haram’s increasing threat to security across West and Central Africa, but underlined the need for Nigeria and its neighbours to take collective action. That President Obama failed to mention Nigeria in his recent State of the Union Address suggests that no major US assistance is planned. Nigeria’s National Security adviser says the country doesn’t need the help of the UN or the African Union. His assertion that Nigeria and its immediate neigbours are in “good shape to address the issue” is scarcely credible, though. The conundrum facing both the African Union and the wider international community is deciding when ‘local’ becomes ‘global’. The destruction of Boko Haram will not necessarily lead to a more peaceful and stable Nigeria. The extremist group rose out of a toxic brew of corruption, religion, politics and ethno-regionalism, in which struggles over Nigeria’s vast oil revenues have played out for decades. That’s a long-term, local problem only Nigeria can sort out. At the same time, Boko Haram’s once fanciful predictions of a caliphate are starting to resemble facts on the ground. It now controls territory roughly equal to the size of Belgium. More and more foreigners have joined its ranks. In some places Boko Haram is beginning to act like a government, providing public security and services. The establishment of a proto-Islamic state in Africa’s most populous state and biggest economy raises a question of global concern: is Nigeria too big to fail? Just as key banks were rescued because the consequences of their failure were deemed too grave for the financial system as a whole, serious consideration must be given to what might happen next – nationally and regionally – should Boko Haram’s campaign of terror go unchecked. Not least of all, to their innocent victims. The insurgency has already displaced 1.5 million people and caused untold fear and suffering now stretching beyond Nigeria’s borders. Pressure on the government to permit international assistance at least around the need to protect civilians is likely to grow. What form that assistance takes will be crucial. NATO initially derived its authority to intervene in Libya from a UN resolution ‘to protect civilians and civilian populated areas under threat of attack’, though its mission evolved well beyond this mandate. Four years on, the motives for the NATO intervention and whether it’s weakened the (still nascent) international norm of Responsibility to Protect are hotly debated. Wariness about ulterior agendas in the region is high. Nigeria’s oil wealth is seen as a major draw for any would-be Western military presence. Cameroon, rich in untapped resources, is increasingly concerned that Boko Haram’s incursions might be the pretext for France to become involved. Though French troops were lauded for coming to Mali’s rescue in 2013, when the capital Bamako appeared set to be overrun by radical Islamists, African governments harbour deep suspicions about France’s motives. Some analysts believe that if Muhammadu Buhari, the President Jonathan’s main contender and a northern Muslim, wins the election on 14 February the insurgency may quieten down, providing a space for negotiations with Boko Haram. As likely, however, is the vote will exacerbate religious and regional tensions within the country, especially if the loser contests the results, as it looks almost certain. Mix in a runaway insurgency, crumbling armed forces and plummeting prices for oil – more than 90 per cent of the country’s export earnings – and the prospect of a ‘perfect storm’ is not so far-fetched. Even if Nigeria is ‘too big to fail’, options available to the AU or Western countries to ameliorate the current crisis are limited. To help fight Boko Haram they first need a reliable military or security partner. As the crisis has worsened it’s become less clear who that might be. Paradoxically, one ray of light in the minds of military planners is that if Boko Haram is indeed transitioning from asymmetric warfare to holding territory, then it’s also making itself a more identifiable target. But that will be small comfort to Nigerians affected by the insurgency. One of their greatest writers, Nobel Laureate Wole Soyinka, remarked last year that dealing with Boko Haram has become “the responsibility of the global community, a crime against humanity has been committed’.